Discussion in 'Υπόλοιπες Κονσόλες' started by chriskgnr, Jun 27, 2016. Joe Decuir started to work for Atari in 1975 and was one of the engineers responsible for designing the iconic Atari 2600 and the 8-bit computers 400/800. The historian-podcaster-writer-archivist Kevin Savetz scanned Joe’s engineering notebooks from the time he worked at Atari and now the precious document is available at Internet Archive. 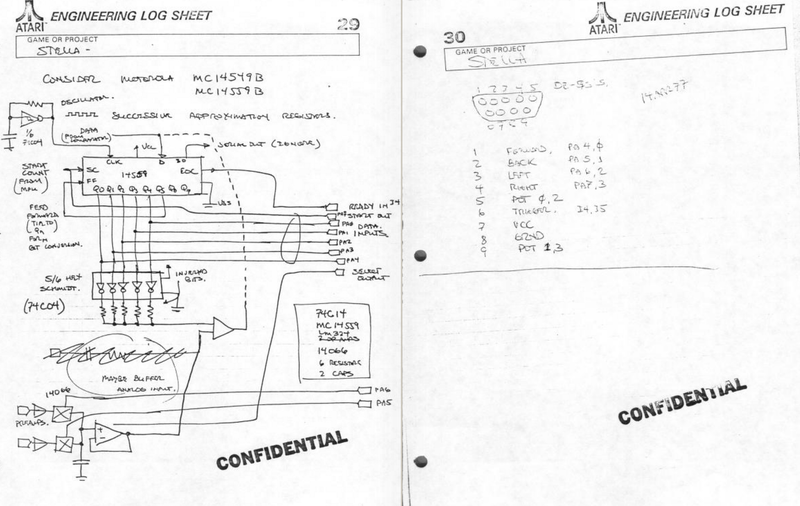 With handwritten notes and schematics, the content of the notebooks will probably only make sense to engineers and alike, but the fact that the document is available to the public and preserved digitally is a great achievement. Early reference to GTIA as “TIA2”. Some descriptions of text/grapics modes only up to 160 pixels. References to graphics memory as 4K (maybe that’s why we have the 4K LMS requirement instead of 8K). Page 100 “Seperate refresh cycles from object fetch cycles” (40 col text doesn’t do this). Colleen/Candy project has reference to “Elizabeth” (a 13″ colour monitor). Some references to 6509 (enhanced 6502 with linear memory addressing). If you want to know more about Joe Decuir work there is an interview published on Atarimuseum.com where he talks about his time working for Atari. There is also a video published on Internet Archive entitled “Retro Computer Projects“, in which he talks about his current projects and plans. At Rose City Atari Club (Portland, Oregon) on June 24, 2016.
και όπως είπε και ένας φίλος, μεγάλος Atarάς, φωτοτυπία και κορνίζωμα τα σχέδια!